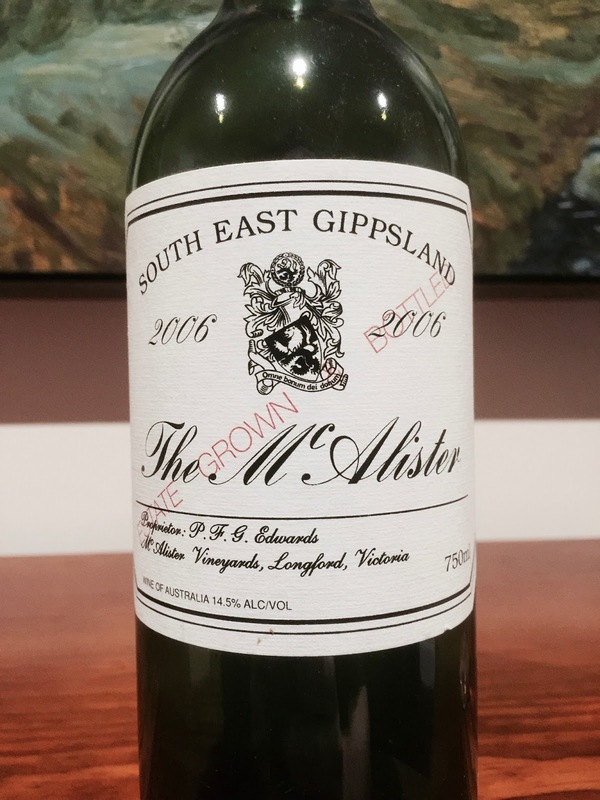 Fresh from my glowing review of the 2010 vintage of The McAlister reviewed here (see also the 2005 reviewed here), I managed to snaffle a bottle of the 2006 vintage of the McAlister to try. I’ve said it before, but it bears repeating: no website, no publicity (well, not that I have seen), from a region that is largely unknown in Australian wine circles and yet this producer in my opinion is plainly among the top tier producers of Australian cabernet sauvignon. The 2006 vintage tasted here sails a smidgen under the heights of the outstanding 2010 vintage, but it is nonetheless very satisfying and well proportioned. And dare I say it, very left bank Bordeaux in style. Were I (hypothetically – I assure you!) thinking about planting vines in an Australian wine region to fashion first rate cool climate cabernet, this producer’s efforts would raise some interesting questions. But back to the wine. The 2006 McAlister has aromatics of cigar box and blackcurrants. The palate is medium bodied with good length and emerging secondary characters of spice, earth and dark fruits. Overall, a lovely expression of medium bodied cool climate cabernet that is suitable for drinking over the next few years. If we want buy, then what is the option? Well, it does make it harder. Some Dan Murphy's stores sometimes have this label and there's always wine-searcher.com. I got in touch with the winery by telephone and understand that the wine is currently sold out.